Wow. Where to begin on this one? We all know the MSNBC’s sole purpose in life is to ensure the out-of-touch liberal that they’re okay; that their garbage opinions are mainstream. It’s meant to keep liberal blood pressures at healthy levels. 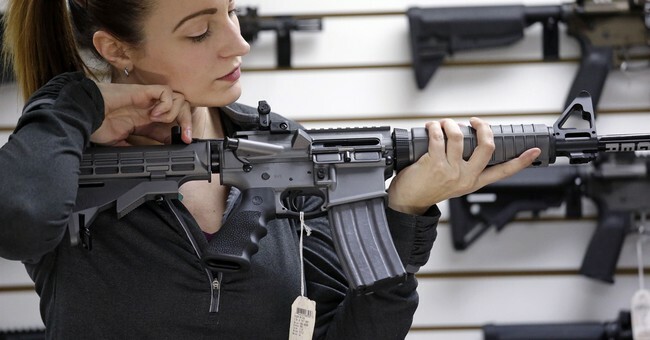 So, in the wake of the horrific shootings in New Zealand that targeted Muslims, the AR-15 is once again coming under fire from anti-gunners. That’s what the shooter used to murder some 50 Muslims reportedly at separate mosques in the city of Christchurch. Host Joe Scarborough said he’s a Second Amendment supporter and a gun owner but supports banning so-called weapons of war. That’s an anti-gun Left talking point. It’s replaced the previous made up term "assault weapon," which has lost its punch due to conservatives rightfully mocking and shredding it as a meaningless politically charged phrase aimed at masking the Left’s ignorance of firearms and instilling fear in voters. In other words, “assault weapon” is liberal code for ‘a gun that looks scary, but we can’t say that because we would look like pansies to the electorate’—too late. Sorry, when you use the Left’s language, you’re out. You’re pretty much saying you’re for the Second Amendment, except that you’re not. A ‘weapon of war’ is an equally idiotic term. To make his argument even more laughable, Scarborough tried to say that the AR-15 is “more lethal” than the M-14, the service rifle that briefly replaced the M-1 Garand, and the M-16. The M-14 didn’t last long in service, but just looking at the calibers these weapons fire is enough to debunk this insane claim. On a side note, the M-14 fires a .308 Winchester, which is much more powerful than the .223/5.56 round that the AR-15 fires. Also, the M-14 and M-16 have an automatic fire setting; the AR-15 can only fire semi-automatic. The AR-15 is certainly lighter, but the selective firing aspect certainly cuts down on Scarborough's claim that the AR-15 is more lethal. Julio Rosas, a U.S. Marine, detailed the differences on Mediaite. Yet, The Washington Free Beacon’s Stephen Gutowski was the person who really torched Scarborough in a lengthy Twitter thread, dissecting every point the MSNBC host made. Also, I want to note something important to @JoeNBC's point on military use. The select fire AR-15 as designed by Armalite became the select fire M-16 after being sold to Colt and adopted by the military. Colt then released the semi-automatic-only AR-15 for the civilian market. In @JoeNBC's thread, there's a conflation of the early select fire AR-15 design with the semi-automatic-only variant that was designed for civilian use and which has been sold in the US for 56 years. To my knowledge, the military has never adopted the semi-automatic-only AR-15. So, there is certainly some debate over exactly what weapons are protected arms under the Second Amendment. SCOTUS explicitly said in Heller than the select fire M-16 is not. It didn't say anything about the semi-automatic-only AR-15 and similar rifles. Given that the semi-automatic-only AR-15 is the most popular rifle in the country, it certainly seems to be "in common use." Given that the semi-automatic-only AR-15 was not submitted for consideration nor ever adopted by the military, it doesn't seem to be "specifically designed for military use." But this is an ongoing debate in federal court with federal judges coming down on both sides of the question thus far. SCOTUS has yet to weigh in. Heller is much more of a compromise ruling than people realize. It seems tailored to overturn DC's handgun ban without wiping out most other federal and state gun laws like the National Firearms Act or Gun Control Act. Yeah, this is why Gutowski is one of the best on this beat. This is a thorough drumming of the anti-AR-15 talking point here.